Having just finished my first semester at Tsinghua University, one of China’s leading schools, I thought that now would be a good time to write a summary of my impressions of the program so far as it relates to the US. One of the most interesting courses I took this semester was American Politics and Policy Toward China, which was taught by a prominent Chinese scholar on the subject of the US. I am something of a US policy wonk and like to believe that I already have a fairly strong grasp of how things work (or don’t work, as the case may be) in Washington, so I took this class to learn about the Chinese perception of American politics. This class ended up being an experience that was sometimes shocking but always fascinating. The preoccupation with the US here permeates many different aspects of student life, from the bizarre (to me) fascination with American high school-style leather and wool letter jackets to the academic obsession with analyzing every factor of US power so as to figure out how China can and should emulate it in the near future. This class essentially functioned as the tip of the iceberg: it was a forum for students in the Chinese-language IR program to voice their thoughts on the US’s internal affairs rather than focusing on its international relations, the aspect of its conduct which is much more heavily and frequently scrutinized. The very first class wasted no time in making me wonder just exactly what kind of rabbit hole I’d elected to jump down. We were shown part of a documentary on the pilgrims and then jumped straight into Mel Gibson’s The Patriot. Not just a few pertinent excerpts, as would be the norm for this kind of thing in a school in the US, but the whole thing. It dawned on me as I watched the Swamp Fox try – and comically fail – to build a rocking chair that the Chinese government was effectively paying me to watch a Mel Gibson movie. Gibson’s films, regardless of the man’s personal failings, are generally entertaining, so I had no complaints. What I found fascinating, however, was the fact that this film was apparently being presented as a documentary, not as entertainment. It was evident from my classmates’ reactions that most, if not all, of them had never seen it before: they gasped in all the right places, evidently seeing the sometimes shockingly violent material for the first time. This film is notorious for its whitewashing of Francis Marion, who in real life is known to have raped his slaves and tortured native Americans, among other crimes; however, none of this was mentioned, critically or otherwise, in the discussion after the film. This viewing served to unironically introduce the class to the American conception of the hero, which was discussed extensively, bringing in the likes of Captain America (no mention of the fact that Steve Rogers was an art school dropout and a pipsqueak who attained his physical prowess from an advanced serum). For many of the students, this ideal seemed to be rather uncritically taken at face value. It would, naturally, be too much to expect a course like this to delve into the nuances of comic book characters, but one of the most piquant moments in Cap’s development was the realization that what he stood for was no longer as relevant as he’d always thought; America had become more cynical than what he had left behind in the 1940s. This rose-tinted, Disneyfied view of America and her principles would in many ways set the overall tone for how the US would be described in subsequent classes. In the student presentations and lectures by the professor, many of the nuances of how our traditional cultural values are viewed today were understandably lost, leaving it to the one other American student in the class and me to do our best to fill in the gaps. The fun part, however, was that the other American leans toward the conservative side of the political spectrum, whereas I lean toward the liberal side. As a result, I can only imagine that our sometimes wildly divergent explanations of the same issues often served to further confuse our Chinese classmates, such as our takes on the issues of welfare, gerrymandering, and the NSA’s phone-tapping programs. The sheer capacity for American political principles to be interpreted so differently, which is one of the mainstays of our political system, in and of itself is no doubt highly alien to students who have grown up under the Chinese model. One whole class was spent just on the subject of America’s political parties, including why we even have them. The basic functioning of democracy is not unknown to the majority of students here, of course, but its particularities, like political parties, are perhaps less understood (the electoral college system can be difficult enough for some to explain in English if it’s not totally comfortable territory, but imagine attempting to explain it in Chinese!). Students understand that there are Democrats and there are Republicans, but seem less aware of the more detailed political cleavings within those two groups. Democracy must seem awfully inefficient at times to external observers, but efficiency is not necessarily the most important trait in a government. As I argued in defense of what the multi-party system that springs from a a community containing groups with competing interests ought to embody, once civilization has taken the step of conceding that individuals in a society have a fundamental right to participate in their own government, there is effectively no turning back from that point even if the process itself can be quite messy and is far from perfect. This is what can make democracy, as others have argued, “the only game in town.” Exploring the intricacies of how these competing groups fight for their interests and principles based on differing interpretations of the same historical documents was one of the most interesting parts of the course. For example, early on in the course, the subject of America’s Christian heritage was an important theme. As I carefully explained, while much of America shares a cultural and ideological lexicon drawn from Judaeo-Christian ideas, this is not the same thing as a legal basis and was never intended to be interpreted as such; as we all well know, disagreement on this point is one of the main sources of friction between various groups in the US. 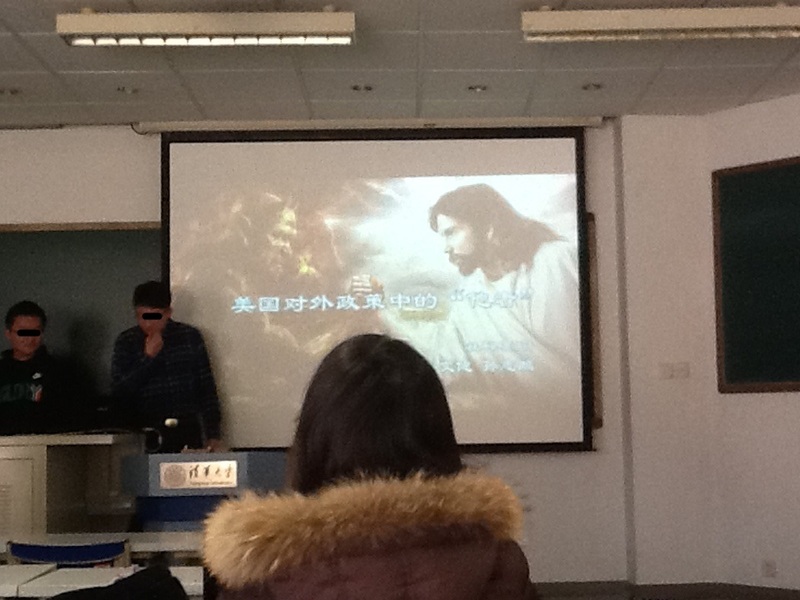 When the class wrestled with the idea of having “separation of church and state,” one student described his experience teaching minority students in China’s western regions. Many of these students had their own religion, he said – an oblique reference to their adherence to Tibetan Buddhism, I believe – and explained that they were able to view political and religious leaders as filling distinctly separate roles that did not contradict each other. The Chinese Communist Party tends to take the kind of stance regarding religious fealty that was famously shared, for example, by those who feared that John F. Kennedy would be an unfit President because he might secretly owe his primary allegiance to the Pope rather than to the American people. That is, the CCP generally believes that minority nationalism and religion are incompatible with greater China nationalism or the religion of the state. The stance taken at least by this student, however, and a few others in the class was that political and religious leaders do not necessarily have to clash. When the professor asked this student what he believed, after hesitating for a moment, he replied that he believed in Communism. The class tittered at this and, flustered, he explained that Communism doesn’t really mean anything anymore so it’s not exactly an ideological commitment to say one is a Communist. In the end, he finally just shrugged and said that he was an atheist. This view on Communism seems to be quite common here; many Western observers have remarked on how little the Chinese political system as it is today is still influenced by Marxist principles, but this view is also shared by many Chinese, from my experience here. Marxism-Leninism here at Tsinghua seems to be reduced to mostly a token role. Contemporary Marxism and Social Practice are ostensibly required courses in my Chinese-language political science program, but when a post-doc TA shyly asked me how I felt about Marxism during course registration in September, I said something that would be roughly translated as “I can’t stand it.” She giggled in response and told me that I didn’t have to take it. Deference to Marxism is still a political necessity since Marxism-Leninism and Mao Thought (regardless of how they are actually interpreted) are still the crucial elements of the Party’s authorizing political myth and cannot be discarded without causing irreparable harm to the Party’s legitimacy, as I argued in my Master’s thesis; it would be a political scandal of the highest order if China’s preeminent university were to openly abandon it. People pay lip service to it but for most young academics, loyalty seems to stop there. Everyone knows that China is not as red as it once was. There are, of course, a few radical individuals here and there who take Mao Thought without a grain of salt, but this mostly seems, in my opinion, to be because they believe that doing so will help advance their careers. In addition to the sometimes sensitive discussions on how American politics function, some of the most riveting discussions centered on American culture. Predictably, our gun culture was no disappointment here. I watched in horror one day as the professor explained that all Americans own guns and that it is legal to kill anyone who invades one’s home (I explained that so-called “castle laws” do not exist in all states and that even within castle laws there is a wide variation between the circumstances that call for justifiable lethal response), that police carry guns in order to shoot fleeing criminals in the leg so as to stop them from running (cops are trained to aim for the center mass because in a stressful situation chances of hitting anything else plummet to almost zero, and, when police use their firearms, they tend to shoot first and ask questions later without regard for the well-being of the suspect), that police don’t want to hurt innocent people (without getting too into the political arguments on either side, I think we can all agree that police in the US could stand to be a bit more judicious in escalating use of force), and that only Americans are allowed to privately own guns (flatly untrue). Like many non-Americans, the Chinese students found America’s attachment to guns perplexing. Civilians are forbidden to own guns in China. It seemed clear to many of my classmates that more guns result in more crime; they did not understand why Americans cannot realize this. The other American in the class, who is an Air Force service member, argued that the right to bear arms is enshrined in the Constitution and is not going away, something that is not untrue and with which I do not disagree. I explained to the class that my view on the gun debate is that there is simply a huge cultural divide on the issue. People from urban areas, like me, tend to only be exposed to firearms as instruments of crime and violence, whereas people from rural areas do not have such negative associations with them because they are simply tools that are a part of life; each group tries to push for national policies based solely on its own cohort’s understanding of the issue, which creates conflict. Misunderstandings abound in this realm, such as some conservatives lashing out at what they imagine liberals want to do to their Constitutional rights even if that may not actually be the case, and some liberals trying to legislate based on things they don’t fully comprehend, such as the infamous meaningless “assault weapon” classification based as much on which guns look the scariest as on anything else. In order to make meaningful progress on the issue of gun safety, I argued, both sides need to be more literate both on the subject matter and on what the other side of the debate actually wants, not what they think the other side wants. As long as prominent Democratic politicians make it easy to mock them for not knowing the difference between a clip and a magazine and as long as the mainstream right regards anyone who says “I’m a supporter of the Second Amendment, but…” as an apostate, progress will be difficult or impossible to achieve. I think that this helped clarify some things a bit for my classmates, but I am afraid that our high number of gun crimes still speaks for itself. For the record, I am in favor of expanded background checks and measures that primarily focus on scrutinizing people who attempt to purchase firearms in order to increase success rates of weeding out the potentially dangerous rather than attempting to control the types of magazines that are widely available, since the latter type of measure has proven not to be the, ah, magic bullet it was once hoped to be, particularly in regard to mass shootings. All in all, the class was pretty fascinating, including the misunderstandings, because it was a great opportunity to clear things up and, hopefully, make America seem less strange. 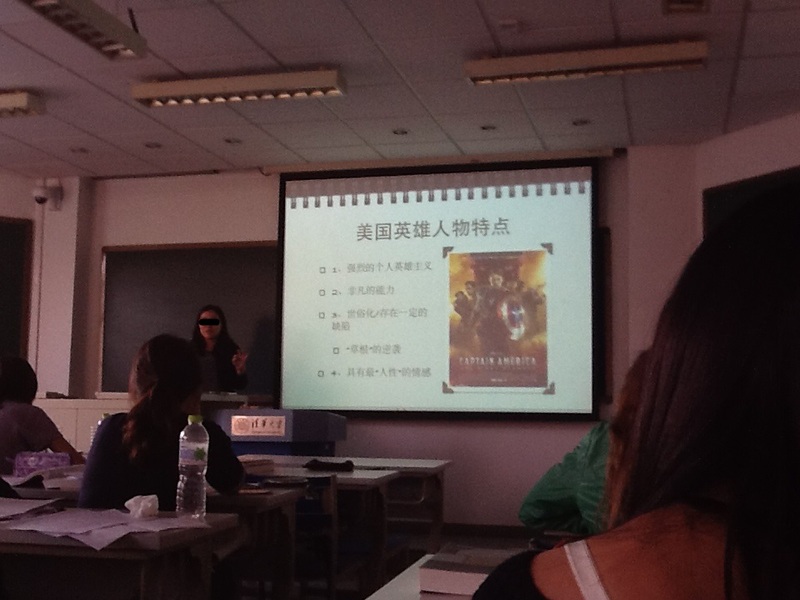 Although I had intended to merely listen to my Chinese classmates’ thoughts, I found myself explaining more and more. This ease with which I explained my points of view, however, was not transferable to the courses on foreign policy. Like some Chinese students studying in America have observed, it can seem more prudent to stay quiet in these classes so as not to become alienated from the rest of the students. Whereas America’s domestic politics seemed to be more of a point of curiosity to my classmates, America’s international conduct is no joking matter. In Chinese Foreign Policy and other similar courses, students’ views tended to fall more or less where one might expect on lines of nationality. This is where students’ (and professors’) preoccupation with America’s comparative decline and China’s comparative rise – to use the Chinese terminology – reliably came out in full force. As an American, I have found that my experiences studying diplomacy have tended to emphasize the give-and-take, back-and-forth nature of it, the attempt to sincerely understand one’s counterpart’s position so as to work out a compromise that is as mutually beneficial as possible. This understanding of diplomacy, apparently, differs starkly from how most of my Chinese colleagues view it, which can be best summed up with a statement made by someone in class: “The only way for China and [a certain country with whom China is currently experiencing diplomatic difficulties] to move forward is for [this country] to accept reality and historical fact (emphasis added),” i.e., for the other party to simply give all and take none in the ongoing dialogue. Clearly, such a result would constitute surrender, not compromise, but much of China’s actions in the Southeast and East Asian sphere have appeared to be driven by this mentality. As it was put quite succinctly in The Diplomat recently, “Professor Zod seems to have been teaching Negotiations 101 when Xi Jinping & Co. took the class. Neither empathy nor tact are hallmarks of Chinese foreign relations.” Zod, for those who aren’t up on their comic lore or who have been stuck in the Fortress of Solitude and therefore managed to miss both Superman II and the much more recent Man of Steel, is a formidable Kryptonian general famous for commanding his enemies to “kneel before Zod.” As one might imagine, this approach to foreign policy does not make it easy to ameliorate diplomatic strain between nations. However, rather than voice my opinion on this matter, it has seemed far more painless to simply listen and try to understand my Chinese colleagues’ stances. I would not go so far as to compare this voluntary silence on my part to self-censoring by journalists in Nazi Germany, as the head of Bloomberg did, but neither would I say that I am entirely happy with it. When I do attempt to discuss various aspects of China’s conduct with classmates, rather than being willing to discuss the matter, with few exceptions most students tend to opt for a polite smile followed by “That is an internal Chinese matter.” Rather than cause tension by trying to force a discussion even outside of class, it seems easier to let sleeping dogs lie. A great deal of the academic discussion here seems to be influenced by economic determinism, which essentially dictates that higher GDP means greater comprehensive power. There are many formulae that students can and do trot out in support of this view; it seems to be taken for granted that if China can keep up its economic growth, it is sure to overtake the US not only as the world’s biggest economy but also as the world’s preeminent superpower. Students seem to focus not so much on whether or not China will overtake the US as they do on what China can and should do once it does. Some academics, like Yan Xuetong, the dean of the Contemporary International Relations Department here at Tsinghua (and also my academic advisor), take a more nuanced stance and argue that mere economic strength is not enough of a basis for hegemony. To be more precise, power derived from economic strength results in hegemony only, and not in more desirable types of superpower status such as “humane authority,” or junwang dao, the only type of superpower that is able to maintain its status through global assent rather than by force. According to Yan’s moral realism, which draws heavily from the pre-Qin dynasty masters of political thought, a hegemonic country’s status will wax and wane as its hard power does, whereas a humane authoritarian power’s status will be tied more to its moral strength than its hard power (although hard power is, of course, not unimportant). This political model is roughly reminiscent of the traditional Chinese cultural model that views China as the “middle kingdom” to which surrounding civilizations are drawn and whose global dominance is passively approved by what are in effect satellite civilizations. Such reforms that would allow this kind of moral realist force to take hold in China have yet to be adopted by the government, but if and when they are, I suspect that understanding between the US and China will be far easier to advance. As one student was asked by the professor during his presentation on US-China relations on the last day of the American Politics course, “Who are America’s friends?” The answer, of course, is those countries that actively uphold global norms. If China wants to be America’s friend, it will have to do that, as well. Alexander Bowe has an MA in International Studies from the Korbel School and is currently a doctoral candidate in Political Science at Tsinghua University. The “I’m not touching you, I’m not touching you!” school of foreign policy (Image courtesy of the Chinese Ministry of Defense). In January 2012, a Florida man shot and killed his perceived aggressor and ignited a nationwide debate on self-defense. George Zimmerman’s shooting of Trayvon Martin quickly became one of the most hotly contested and publicly scrutinized cases in the US since OJ Simpson’s alleged murder of his wife in 1994. At the heart of the controversy was a legal principle known as “Stand Your Ground,” which states that in cases of self-defense, even in public areas, those who feel threatened are not obligated to first attempt to deescalate the situation or seek safety before resorting to force. Even though he knew of the law’s existence, Zimmerman did not, in fact, actually make his case based on this principle – nor did the prosecution seek to show that he had even had an opportunity to retreat – but nonetheless the public debate surrounding the case primarily focused on the law in part because the judge specifically ordered the jury to consider its implications in their deliberations. Florida’s law received a great deal of attention throughout the case, but this law is not unique to Florida: more than thirty states in the US have some type of Stand Your Ground law, either explicitly or through case law precedent, while nearly all fifty US states have some variant of the similar but more moderate “castle law,” which applies only to one’s home instead of any area. Critics of Stand Your Ground laws worry that the assurance of legal protection for reacting to any perceived threat legitimizes and enables aggression since the law (in Florida’s case) disregards completely the circumstances which led up to the confrontation; all that matters is that responding to a perceived threat is legitimate. According to Attorney General Eric Holder, Stand Your Ground laws negatively impact public safety and security “by allowing – and perhaps encouraging – violent situations to escalate in public.” Holder’s (and others’) concern is that under the protection of this law, Americans might, by escalating situations in ways that are nor overtly illegal or openly aggressive, deliberately allow confrontations to develop to the point where they will have a justifiable excuse to respond with force simply because they provoked their opponents into drawing first blood. The text of Florida’s Stand Your Ground law reads, “A person who is not engaged in an unlawful activity and who is attacked in any other place where he or she has a right to be has no duty to retreat and has the right to stand his or her ground and meet force with force, including deadly force if he or she reasonably believes it is necessary to do so to prevent death or great bodily harm to himself or herself or another or to prevent the commission of a forcible felony.” In the Zimmerman case, many observers reluctantly concluded that although Zimmerman’s actions were arguably not truly in the spirit of self-defense due to the larger context of the confrontation, according to the wording of the law no legal outcome other than acquittal was ever likely. Juror B29 stated after the trial that Zimmerman “got away with murder… but the law couldn’t prove it… You can’t put the man in jail even though in our hearts we felt he was guilty. But we had to grab our hearts and put it aside and look at the evidence.” Even though evidence in the developing case indicated that it was highly likely that Martin was the first to actually use force by grabbing Zimmerman, striking him, and bashing his head against the ground, supporters of Martin stressed repeatedly that the confrontation would never have occurred in the first place if Zimmerman had not made the decision to leave his car and investigate a figure whom he subjectively deemed to be a suspicious person, which he had no authority to do and was told by 911 responders not to do. In sum, Zimmerman independently sought out and created a situation in which he then had a legal opportunity to respond with lethal force; the crux of the issue is that none of it would ever have occurred if Zimmerman had simply minded his own business rather than going out of his way to create a threatening situation to which he then felt obliged to respond. This principle is arguably the essence of China’s regional foreign policy as exhibited by its newly expanded Air Defense Identification Zone. Since at least the 1990s, Beijing has been gradually escalating tensions resulting from contradictory territorial claims, but always in ways that are neither overtly aggressive nor blatantly illegal in order to maintain the carefully constructed appearance of non-aggression and “peaceful rise.” China and its neighbors have routinely patrolled contested waters in the South China and East China Seas in order to reinforce their control over the regions, but China has when possible taken the opportunity to subvert these attempts without being openly aggressive. In 1995, after a severe storm that forced Philippine naval vessels to withdraw from the contested Mischief Reef in order to seek safety, Chinese vessels quickly took over the area before the Philippine ships could return and – over the loud but ultimately ignored protests of Manila – constructed platforms to secure its ownership and control. More recently, Beijing employed a similar tactic when it double-crossed Manila after a mutual agreement to withdraw from Scarborough Shoal in the spring of 2012, claiming never to have signed the agreement, sending vessels to reclaim the area after both fleets had withdrawn. Beijing has also made use of this “salami-slicing” strategy on its western borders in disputes that are less widely reported in mainstream media but no less hotly contested: in areas whose ownership India also claims, China has sent troops to first secure control and then later construct camps and roads as a means of demonstrating ownership, a practice that has been utilized in the region since at least the 1950s. To date, Chinese salami-slicing has mostly consisted of moving into disputed but vacant territory and essentially planting a flag and maintaining a presence in order to be the new king of the mountain; since these areas have all had unclear legal ownership and no direct pushing out of foreign forces, China has been able to avoid actively initiating conflict and thus maintain its claim of “peaceful rise” with the exceptions of small border wars in the mid-late twentieth century. More recently, however, Beijing has begun to display the kind of behavior that could arguably be characterized by the concerns reflected in Attorney General Holder’s comments above. As China has more aggressively begun to realize what it believes is its destiny of East Asian dominance, its tactics have shifted from claiming disputed territories that are closer to its sphere of control through minimally confrontational means to now beginning to stake claims in regions where their arguments are much weaker or even totally baseless. When Japan mused on the possibility of shooting down Chinese drones that illegally entered its airspace, Beijing was quick to declare that it would consider such a response an act of war and would respond with force – even though Beijing’s illegal activity would have pushed Japan to protect its own sovereignty in the first place. In China’s eyes, its retaliation in this case would be an act of self-defense because it would not view itself as the aggressor in spite of its trespassing. 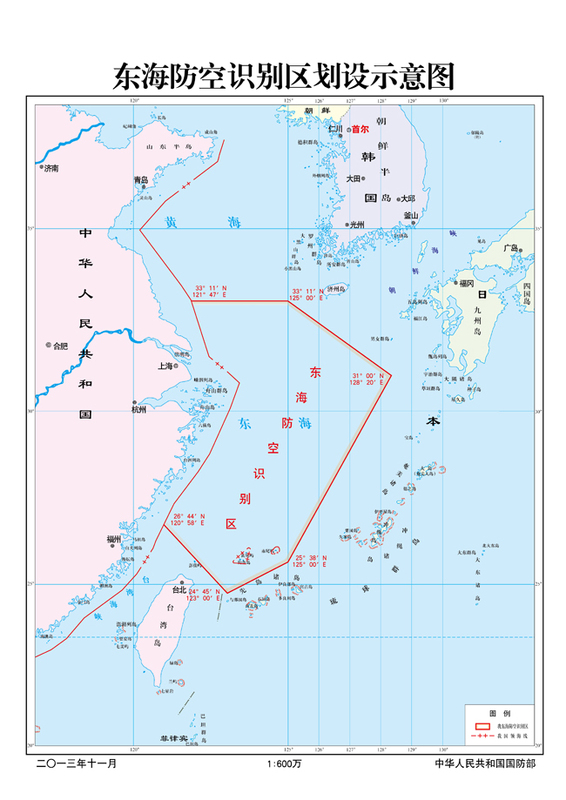 Beijing has recently raised even more eyebrows with its newly expanded Air Defense Identification Zone in the East China Sea, which now explicitly includes the Senkaku/Diaoyu Islands even though Japan arguably has the stronger historical claim and also conflicts with Japan’s previously established zone (there is no internationally agreed-upon basis for establishing such zones). China also was upset by Japan’s installation of anti-ship missiles in Okinawa this month, islands whose control is completely in Japanese hands. The missiles were installed to send a message regarding China’s aggressive encroaching on Japanese territory, which Japan intends to defend. China’s behavior has strayed toward the risk of creating conflicts in which it would then be obliged to defend itself, squarely placing the blame on the other country for initiating. This is the essence of the Stand Your Ground principle as it is reflected in Florida’s statute: considering a retaliatory use of force a legitimate instance of self-defense regardless of the events that lead up to violence, even if the party that claims self-defense deliberately escalates and creates its own confrontation throughout the encounter. As China acts increasingly aggressively in its claims on territory that is decreasingly in dispute and increasingly in control of its rivals, it seems likely that it will eventually force their hands in pushing back, which may be just what Beijing wants: the excuse to claim aggrieved status and retaliate even though the conflict was completely avoidable. In order to show firm support for freedom of navigation in open areas, which is a core policy driver for Washington (and to show support for its ally, Japan), the United States deliberately sent two bombers on a flight through China’s new air defense identification zone on Tuesday, demonstrating that the type of aggression demonstrated in the zone’s recent expansion – which threatens to dangerously upset the status quo – will not be tolerated. Beijing’s rhetoric has consistently claimed that China’s is a “peaceful” rise, but such behavior is not in the spirit of peace or cooperation. If a person aggressively invades another’s space in an intimidating manner and dares him or her to “make his day” so that he has an excuse to hit back, we would not say that this person is acting peacefully. If a person breaks into another’s home and kills the inhabitant in response to the latter’s use of force under a castle doctrine, we would not say that this intruder is acting in self-defense. Protecting sovereignty is as much a fundamental right of countries as protecting life and limb is a fundamental right of individuals, but deliberately blurring the lines of what counts as self-defense is dangerous in either case. In international relations, just as on the level of individuals, the right to stand one’s ground even after being the one responsible for creating the confrontation in the first place should not come at the expense of others’ rights to true self-defense, which should emphasize deescalation and appropriate, justifiable use of force. When aggressive people learn that they can get away with initiating and escalating violent confrontations simply by claiming self-defense, what incentive do they have to act differently in the future? 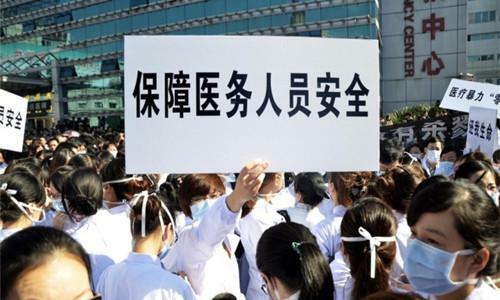 “Protect Medical Workers’ Safety.” Courtesy of Caixun. Many Chinese are extremely dissatisfied with the state of China’s healthcare system. The world has seen in the last couple of weeks just how frustrated some in China are over its healthcare situation, which causes many people to act under the same assumptions as the anecdotal snake-bitten farmer. China’s urban hospitals are constantly overwhelmed by patients who have traveled great distances, resulting in an even higher strain on the already insufficient system. The too-few doctors are being spread far too thin to be effective: according to the Wall Street Journal, in 2010 there were only 1.4 doctors per 1,000 Chinese, meaning that average appointments only last a few minutes. Chinese doctors are even notorious among expatriates for making shoddy diagnoses with potentially severe ramifications. China’s medical system has been broken for quite some time, in fact. Rising costs and under-trained professionals are just the tip of the iceberg. During the Cultural Revolution, rural China relied on so-called “barefoot doctors” (chijiao yisheng), minimally trained medical workers whose expertise mostly covered basic hygiene, preventive healthcare, and family planning, since professionally trained doctors were rarely willing to work in remote areas. This system was highly effective in many areas but ceased in 1981 as part of China’s larger shift away from collective-based management. As a result of the shift from healthcare provided by collectives to privately managed healthcare, coverage in rural China dropped from 90% in 1981 to just 7% of all counties by 1999. Since 2002, government-funded rural health insurance in the form of collective medical schemes (CMS) that mimic the old barefoot doctor system in some ways has significantly increased rural coverage: by 2009, 94% of rural counties offered coverage under CMS. The amount of coverage provided under these schemes, however, is still relatively low: current premium subsidies are about ¥80 (roughly $13) per capita. The legacy of poor coverage since collectivism effectively ended and the current low coverage levels are some of the factors that drive rural Chinese to ignore their rural providers and travel to cities instead, which results in the overwhelming of urban infrastructure. The rising costs of healthcare in China remain a huge obstacle even where coverage is available. By 2020, total healthcare expenditure is expected to hit $1 tn as China continues to modernize its infrastructure. A great part of this cost is due to the increasing ubiquity of Western medicines. Traditional Chinese medicine (TCM), which relies mostly on formulas composed of plants, animals, and minerals, all of which are collectively referred to as “herbs,” is still common and is generally less expensive than allopathic medicine since it does not rely on costly chemical processing and manufacturing. However, the use of allopathic drugs has shot up over the last couple of decades while the prevalence of traditionally trained TCM doctors has declined: as of 2007, there were only 270,000, half as many as in 1949, while the number of Western-trained doctors had increased by a factor of twenty to approximately 1.7 million. Currently, as much of 40% of China’s healthcare expenditure goes to medicine, compared to 10-12% for most Western countries. Part of this abnormally high cost, as has been revealed in the wake of the ongoing GlaxoSmithKline pharmaceutical scandal, is due to corruption and bribery aimed at increasing profits. Public hospitals are often encouraged to over-zealously prescribe medications to patients in order to gain more revenue; this, combined with the high prices, amounts to an extraordinarily high overall expenditure on medicine. Clearly, both patients and medical staff are extremely dissatisfied with the current state of China’s healthcare infrastructure. It will be absolutely necessary to continue to modernize and ramp up government spending in order to both make care more affordable and to decrease the individual workloads of doctors. This will be especially crucial in the coming years as China gets older and thus becomes more susceptible to chronic degenerative diseases. In addition to the rising risk of cancer and heart disease, which are now China’s top killers, according to a new study, half of all adult Chinese may be pre-diabetic, meaning that many Chinese will likely depend even more heavily on the medical infrastructure in the near future than they do now. At its current levels of coverage and quality, the system just won’t cut it. It is often said of China that its main problem is “getting old before it gets rich”; getting sick before it gets rich may be more than the system can handle, and it may once again become the “Sick Man of Asia” but in a more literal sense than ever before. As China’s celebration of Golden Week, the holiday commemorating the founding of the People’s Republic on October 1st, 1949, winds down and millions of Chinese return to their everyday routines, it is a time to consider the obstacles that the world’s most populous nation currently faces. China’s famed economic growth has been slowing recently and many wonder if Beijing will be able to persist and maybe eventually overtake the United States. In a recent book, Yan Xuetong, the Dean of Tsinghua University’s International Relations Department and one of China’s most prominent public intellectuals, optimistically forecasts that China will, in fact, be able to maintain its growth. Yan argues in History’s Inertia (lishi de guanxing), his new book, that China should be able to maintain its economic boom over the next decade and maintain an annual growth rate of roughly 5% after that, which will be enough to see China become a global superpower. The key to achieving this, Yan asserts, is introducing substantive reforms that will allow the country to adapt and overcome circumstances just like during the “reform and opening” that Deng Xiaoping oversaw in the 1980s. Those reforms allowed China to recover from decades of stifling central control and grow into the powerful nation it is today. Here is a rundown of some of the main issues these new reforms will have to address in the coming years. All of these topics are worthy of extensive and in-depth exploration, but a brief overview will suffice for now. Corruption: This is probably the most serious issue because no matter what reforms Xi Jinping and co. introduce, nothing will happen if Beijing can’t enforce them adequately and uniformly, and local government officials are notoriously evasive when it comes to doing things that they don’t exactly want to. As I predicted in an earlier post, Beijing seems intent on demonstrating that it is serious about cracking down on high-profile corruption; Bo Xilai’s life sentence, which was harsher than many expected, is a strong indicator of this seriousness. Beijing’s merciless conviction of one of the nation’s most well-loved and well-pedigreed rising political stars should have sent a clear message to those who might consider graft or using their offices for personal gain. Xi has gone on the record saying that tackling corruption is his highest priority; taking down a highly visible crook is one thing, but most Chinese are more concerned about small-time official corruption than headline-grabbing national cases. The local corruption cases are the cause of most of the things that make the Chinese lose faith in their government, such as poorly constructed infrastructure projects that collapse, contamination of food due to poor industrial oversight, and a general lack of faith in the justice system. For real success over the long term that will help maintain the public’s confidence in the government, Beijing needs to keep doing more to create a pervasive anti-corruption culture in all levels of government, not just catch the big fish. Population and labor force: China’s population is expected to peak at 1.4 billion around 2026. While a population as large as this brings its own particular problems, the biggest threat to continued Chinese growth and stability stemming from this is the dependency ratio. The dependency ratio is the number of non-workers (i.e., dependents) to workers in an economy and is a crucial indicator of growth prospects; an economy that is too weighed down by elderly and children will have difficulty accumulating savings, among other things. China is aging quickly, setting up a series of major problems later on. This is tied to the fertility rate, which has been falling for decades and is currently 1.56. China’s labor force peaked in 2011 and saw a decline of .6% in 2012. As the labor force continues to shrink, China will be hard-pressed to keep up its economic growth. Beijing has been thinking about reforming the One Child Policy for some time but has only adopted the mildest of modifications. Improvements will not happen overnight even if radical policy changes are made; indeed, with a chronic problem like this, only long-term solutions can work, so radical adjustments would not help even if the Party wanted to take that route. Since there will not be enough working-aged adults in China to comfortably support both themselves and dependents in coming years, one solution may be to allow in more immigrants, but given the already huge population, this is politically sketchy at best. There have been other consequences of China’s artificially manipulated fertility, such as gender-based selective abortions that have caused men to severely outnumber women, but arguably the labor force issue is poised to create the biggest stumbling block for the country. Pollution: China’s pollution problem includes both air quality and contamination of other natural resources. As was mentioned in an earlier post, Beijing is planning a massive 1.7 trillion RMB initiative to combat smog. This plan will reduce PM2.5 contamination by 25% , lower Beijing coal use by 50%, cap the number of vehicles at 6 million, and force 1,200 companies to either close up or meet stricter standards by 2017. This plan, if successful, could prove to be a model for the other Chinese cities that suffer the most from smog – Beijing isn’t even the most polluted – and go a long way toward satisfying the demands of the increasingly well-off urban middle class for cleaner living. The more the government is associated with unclean air, the less legitimacy it will retain in the eyes of the public as the effects become increasingly visible. Cleaning up the air and water will be crucial both to maintain the Communist Party’s legitimacy and to keep the health of the Chinese people from being harmed any further than is already unavoidable. Water: China has about 6% of the world’s fresh water supply and has to provide for a fifth of the entire human race with that amount. According to the Wilson Center, however, one out of every two gallons of water in China is polluted. Half of all groundwater and 2/3 of all surface water is contaminated. This is largely from industrial pollution but also from power generation: 70% of all power in China comes from coal, consumption of which will increase as much as 30% in the near future. What’s more, the processing and use of coal requires a great deal of water, which is already scarce in much of China: 80% of the nation’s coal comes from water-scarce regions. Further complicating this is the fact that most of China’s water is in the south, whereas most of its agricultural land is in the north. The government has just finished a massive undertaking to re-route water from the southern, more heavily populated regions to the relatively sparsely populated north… in order to grow the food with which to feed the population-heavy south. China, as the world’s largest grain producer, desperately needs water to grow its food but at the same time is increasing its use in power generation, which demands more water, leaving less for domestic use. At current rates, China is expected to be more or less out of water as soon as 2030. Beijing desperately needs a solution here since water is literally the sine qua non of everything else it might wish to do: without a stable water supply, no country can hope to survive. A good place to start would be to cut back on energy that requires water – the tricky part is that most methods of conventional power generation also require water, not just hydropower – and to import more grain while decreasing domestic production, but this problem has no easy solution and few hard ones. Human rights: Yan Xuetong believes that as China’s power draws nearer to the US’s, the differences in the ideological aspects of their political institutions will weaken, which will include their views on human rights. For the time being, however, Beijing is infamous for its problematic relations with ethnic minorities, its issues with human trafficking, and its harsh crackdowns on political dissenters. In order to be viewed as legitimate in the eyes of the world, Beijing must attempt to resolve these matters favorably. Even the issues that seem simple, however, like internet restrictions, are politically difficult: as long as the Party fears that an open and free internet will undermine its power, net access will remain restricted. Some observers were hopeful that a new free trade zone in Shanghai with unrestricted internet access might herald a new liberality in this regard, but these reports were ultimately proven false for now. Much of early Chinese political thought strongly emphasizes the aspect of morality in the leadership of a state; if a state is governed with morality, others will naturally be drawn to it and validate its authority without a need for subjugation by force. In the 7th century BCE, Guanzi wrote, “If a country is large but governed by one who is petty, the country will be governed in accordance with that man; if the country is small but governed by a great man, the benefit to the country will be great.” Without this element of morality, only military strength will be able to maintain a country’s status, which will fade as its power does. This is the difference between “humane authority” and a hegemony or tyranny. If China is to become (and remain) a superpower over the next decade, humane authority will be the only way to both overcome its current obstacles and remain stable in the future. If it tries to hold onto power merely through sheer force and fails to address its underlying critical contradictions, as other superpowers have tried to do in the past, it may end up on the ash-heap of history, after all. Imagine that you are standing at a junction in train tracks with your hand on the lever. You can see a train barreling toward you from the left; you can also hear the engineer’s frantic whistle blows. You look to your right to see what or whom the engineer is trying to warn and notice a group of people – say, five or six – tied to the tracks directly in the train’s path. 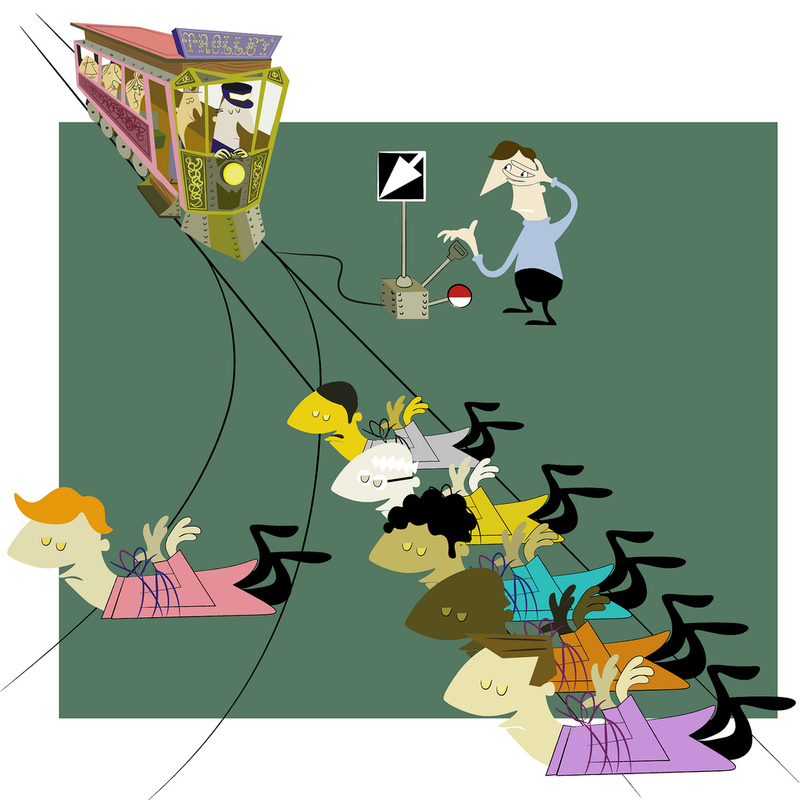 You start to pull the lever in order to change the train’s trajectory to the other track, but then suddenly notice that the other track has one person tied to it in the same fashion. Therefore, you have two options: either do nothing and allow a large group of people to die, or act and directly cause the death of a smaller group. What do you do? This dilemma is known as the Trolley Problem and is well-known in the philosophy field. First proposed by Philippa Foot in 1967, it is a thought experiment that allows us to examine hypothetical situations by applying reason and ethics. Like Lartéguy’s Ticking Time Bomb, Nozick’s Experience Machine, and Rawls’ Original Position, Foot’s question has had a lasting influence on how we think about ethics. If her proposal sounds familiar, it is because it is in essence the same dilemma the US under President Obama faces regarding the Syrian civil war: whether to act and potentially cause additional deaths or to remain passive and simply allow the current deaths to continue. Some critics have pointed out the futility of engaging in even more killing in order to stop killing that is already happening and others have responded that it would be worse to allow Assad’s slaughter to go on unchecked (For now, let us leave out the additional ethical variable of chemical weapons since it has not been proven conclusively that Assad’s regime has actually used them), in effect validating his actions. It is rare that political theorists are able to so directly apply abstract thought experiments to real-world issues, so this opportunity should not be squandered. The trial of Bo Xilai, former senior Party leader of Chongqing, has fascinated China and much of the rest of the world. Bo fell from grace dramatically last year when he was arrested amidst accusations of using his office for personal gain and in connection with a suspicious death of a foreign man. As a highly visible figure in Chinese politics, his allegedly scandalous behavior has been taken very seriously by the authorities. Both Chinese government leaders and external observers have repeatedly pointed out that corruption and unbecoming behavior of public officials severely threaten China’s future stability and the people’s faith in the government. Bo’s personal popularity also strayed dangerously close to a cult of personality, which is viewed as anathema to China’s governmental legitimacy. The country’s experiences under the cult of Mao Zedong demonstrated just how badly things can go when a single man’s ideology takes precedence over sound policy and institutional accountability as a whole; those wounds are still too fresh for the government to allow anyone else to even approach that kind of power. Due to the combination of reckless behavior and personal power that may have grown to threaten Beijing’s authority, Bo’s arrest seemed to have been a long time coming.